There was something special about the Sun Bowl Stadium when it opened on Sept. 21, 1963. On the first play from scrimmage at the then-30,000-seat stadium, Miner running back Larry Durham bolted 54 yards for a touchdown against North Texas State University. The Miners went on to score a 34-7 victory over the Eagles. The facility was originally designed to hold 30,000 spectators. The second deck on the press box was completed in 1969, and in 1982 extra seating was added. The present seating capacity is 51,500. 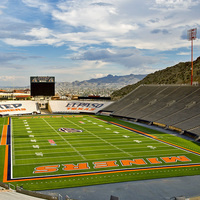 The stadium is not only home to the UTEP football team, but also houses the Sun Bowl game every December. Recent additions to the stadium have included a state-of-the-art video board and scoreboards and a Matrix 46 playing surface. Over seven million fans have passed through the Sun Bowl turnstiles, and the Miners set a school record for attendance in 2005 at 47,899 fans per game. UTEP has played 307 games in the Sun Bowl and enjoyed undefeated home record in 1988 (6-0) and 200 (5-0). The Sun Bowl was recently selected as the "Best Stadium in Conference USA" by The Sporting News magazine.